One of the stories my mother often narrated in our childhood, my brother’s and mine, was that of Grandma Moses. In my mother’s telling, Grandma Moses grew up as a farm hand, became a farmer’s wife, raised a big family, faced the loneliness and difficulties of widowhood from her mid-sixties, renewed her interest in painting at that time, and was ‘discovered’ by the art world in her late-seventies. The crucial part of the Moses story for my mother, I think, is that a self-taught, single, woman artist with no professional scaffolding found a life in the world of art at a very late age. Married at 26, widowed at 49, my mother had found herself living a nomadic life after my father, a field geologist, entered her life. She gave up working. Moving from place to place with two children and a husband who developed a serious heart condition at just 37, it was never possible for her to cultivate anything like a career in painting. The story of Grandma Moses must have made my mother hope it was never too late. For all our lives, when my brother and I were growing up, my mother drew or painted. Often she drew or painted for us – our school projects got a lot of help. Once we were gone, there were others: the number of neighbours’ and relatives’ children she has taught cannot be counted. All along, though, she kept making the pictures she herself wanted to make. There are even pictures she drew in charcoal dating from the sixties, done from the awning of a tent. Moving house recently, I found her pictures in forgotten cupboard drawers and between the pages of long-unused drawing books. When the opportunities presented themselves, she painted covers for publishing houses; she illustrated books, designed block prints. It was all done on her own, in time she carved away from the people she had to look after. Most formally trained artists bestow a gently patronising kindliness on the artistic efforts of people who lack a formal pat on the back from an institution in the form of a degree. Who, after all, doesn’t paint a few watercolours or draw a few pictures? They deserve encouragement (measured out in coffee spoons). My mother gratefully reported to me whatever praise came from “real artists”, as if she were not real enough. Of a compatriot at school who went on to become a “real” artist, she spoke in tones of unjealous admiration. Of late, my mother has formed a community that is all her own: it is one made of picture framers. These are specialist framers, imposing gentlemen in black-framed spectacles and rin-white dhuti-panjabi, who frame the work of well-known artists. Over the many years that my mother has been going to them, they have been looking at her work, critiquing it, giving her the nerve to go on. Most artists need the opinion and affirmation of their peers but the self-taught artist has no community to fall back on. 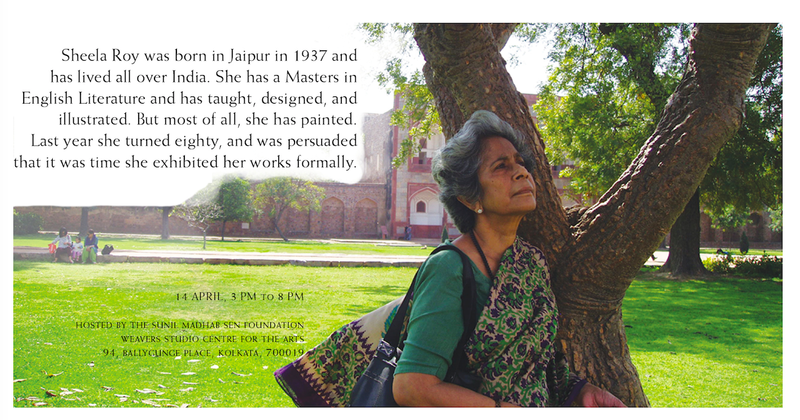 These art framers, who spend their days with the work of recognised painters, have become her community. This year, my mother is exhibiting her work formally for the first time, and the art framers have become her constant friends and advisers through the preparation. Since she has never exhibited before, she did not know the basics: do you take the pictures to the gallery strung or unstrung? Do they hang them up or do you? Do they need captions? “Don’t muddy the waters putting up a picture you don’t like,” the framers told her. “Be ruthless, leave things out.” She took their advice to heart, the excision process began immediately. The exercise of excavating all that she has painted has been an instructive one. We realised that her range is enormous. There were landscapes, still lives, portraits, studies of plants. There are different mediums too: she began with watercolours, but moved to pastels initially to tackle a tremor in her hands that came with age -- and found that she liked pastels better. She uses mixed media in many of her pictures, and has even experimented with collages. Among my own favourites are the pastels she did in a small notebook sitting in a garden in the Kumaon hills: quick lines and dashes of pastel, squiggles of ink, smudges of charcoal. What is astonishing is that her strokes have become more fluid with age, her expression confident, the pastels and drawings atmospheric and sure. At eighty, she is ready for a show. On 14th April from 3 pm to 8 pm, at the Weavers Studio Centre for the Arts, 94, Ballygunje Place, Kolkata. Get updates from The Sunil Madhav Sen Foundation, which is hosting the exhibition. 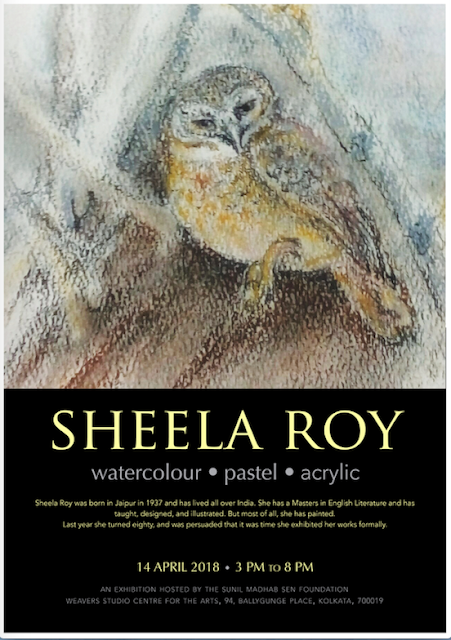 I have always admired Sheela Roy for her enormous courage. She has also found opportunity in unusual places to use her talent to draw and paint. Her early cards were beautiful. Her recent work in Ranikhet are inspiring. How wonderful to hear that. It's true, her work is becoming better and better. Thank you! I just went through the little write-up you have written on Shila mashi comparing her to the grandmother Moses. It's delightfully written and I am looking forward to seeing her show in April. This is very encencouraging to me as my art journey is similar to your mother, and am recovering from few blank years. Lovelorn reading this. As I write I am in village of Gwaldem, all by myself as Harish his trekktre in hills.